Glentress Forest Lodge timber frame Pods are arranged in small clusters with vehicle access to each area. Available to rent on per night basis our Pods can sleep 3 people in comfort and up to 5 people if required. 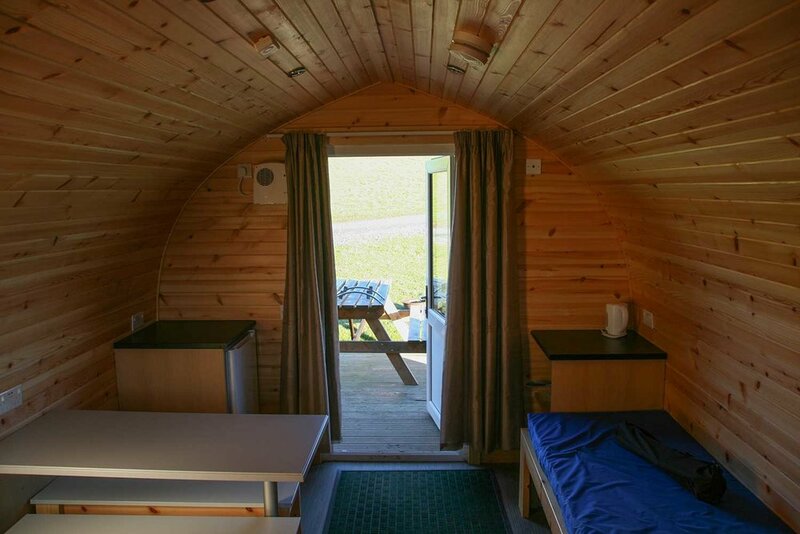 The Pods are the ultimate in camping cabins: ideal low cost accommodation units on the doorstep of Glentress Forest and a great alternative to camping under canvas. Our Pods come serviced with heating, light and a small fridge. They have two roof lights and one opening window, providing a high level of natural light and ventilation and are fully insulated to provide a warm, cosy environment ideal for all year round use. Each Pod comes complete with a picnic table, BBQ, and camp fire with firewood available on site. Disposable BBQs are available to buy from reception. We have separate male and female toilet and shower rooms that have a constant supply of hot water...ideal to clean off all that muck from a day on the bike. Or just a great way to freshen up before heading down to Peebles for a night out. We also have a dedicate drying room with plenty of hanging space to hang up all that damp dirty gear. Leave it overnight and it'll be ready for you hitting more trails the next day, whether you're walking them of biking them! And if you fancy a change from barbecues or eating out, we have a communal kitchen area, allowing you to cook your own culinary delight. We know that a lot of our visitors are avid bikers. We also note that bike's these days aren't cheap. That's why we provide a secure container in which to store your bike, allowing you to leave camp for a while safe in the knowledge that your bike will still be there when you get back.